It seems like the vampire craze has not yet cease to fall in terms of popularity in western culture (yes I’m glaring at you the ENTIRE Twilight saga). This is also apparently evident in the anime world as well. The only anime I’ve ever seen that was vampire-based was Vampire Knight and I quickly dropped that series after the first episode since I couldn’t stand any part of it. I tried to give the vampire hype another try with Owari no Seraph and the results were better than I expected it to be. So the world looks like it’s infected by a virus that seems to kills anyone over the age of thirteen, and vampires swoop in onto Earth and escorts whoever is not killed by the virus to I guess a vampire- alternate world. Of these kids who are escorted by the vampires are best friends/adopted brothers Mikaela Hyakuya and Yuuichirou Kyakya, Yuuichirou manages to escape back to Earth and joins the army while Mikaela stays with the vampires after failing to escape. The story sounds a bit petty in my opinion and I dreaded to continue watching as I kind of got the gist of where the story was heading. While watching a the anime, there was one confusing aspect that I would like to point out that maybe someone would like to clear up for me. And that was when Yuuichirou enters back into Earth he’s greeted by adults (who are human) – I thought there was a virus that killed everyone under over 13…? Apparently not so it displays. Other than that things seems to be fine. I like how within the 12 episodes things are NOT rushed. The first season focuses on Yuuichirou’s military journey and developing relations with his military team members. Of course there’s action and fighting but the majority of that is within the last few episodes, the majority of the episodes focus on plot development. Kudos to Wit Studios for taking this approach with Owari no Serpah. The characters are a bit bland to be honest. Mikaela Hyakuya, who’s a fan favorite barely gets any exposure compared the rest of the main characters in the anime. Then we have our shounen MC Yuuichirou who literally reminds me of Naruto. He will do anything to gain power and protect the people he loves. Speaking of Naruto I guess Mikaela is comparable to Sasuke since Mikaela and Yuuichirou sort of have that Naruto/Sasuke dynamic between them. The other main characters worth mentioning is Shinoa Hiiragi, literally the only person with personality on the show and is able to add some spice and chemistry among the rest of the characters with her playful aura. Animation and music seems to be fine as well. The animation is up to date with most of whatever anime is out there now, and I didn’t notice anything I would want to complain about when watching. The music was pretty good, better than the animation; I REALLY liked the opening they chose, which was X.U. by the great Hiroyuki Sawano. It’s sung in English and has this mysterious tune with dubstep elements added to it. Ending was meh, but the OST faired nicely to my ears. It’s difficult to find the OST since it’s not on YouTube or Soundcloud, but if you get a copy of it on hand it’s a nice playlist. Overall, it’s an ok anime. Not something I would say it's a must see but if your backlog is empty then try this out, it’s not too bad. I only bothered to check this out since I literally was running out of “good” anime left to watch. 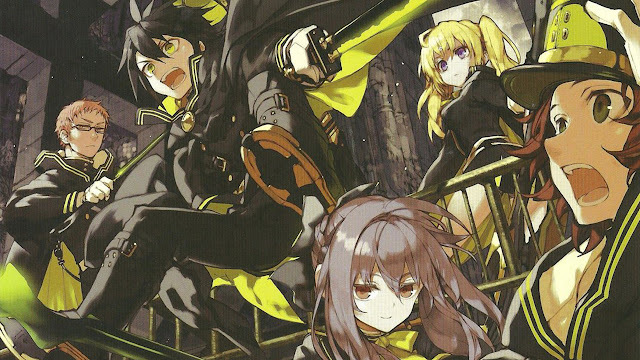 So I guess this wasn’t too bad… I’m sure the first season was to layout the groundwork and develop the plot and when season 2 comes during the fall it’s going to get better in terms of giving the fans what they want which is more action and more of that Mikaela and Yuuichirou dynamic. If you made it this far into the review, thanks for reading. Please leave a comment down below on your thoughts about this anime and your thoughts of my review, did you agree or disagree with me? Thanks again.